Tuesday October 22 1907 I did baking in the forenoon and mended the clothes and put them away I went down with the horse & buggy, stopped at Woolfs & Fannies. She came home last night bringing her Aunt with her. I did some sewing on Hatties machine. Emma Bivens was there I brought her over to Folsoms on the way home. I did the evening work and read some. Weather beautiful today. 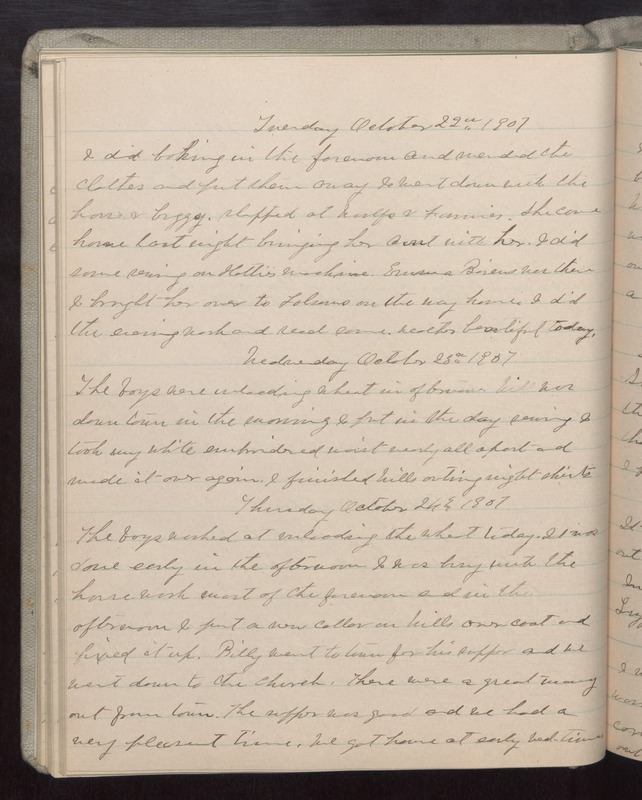 Wednesday October 23 1907 The boys were unloading wheat in afternoon. Will was down town in the morning I put in the day sewing I took my white embroidered waist nearly all apart and made it over again. I finished Wills [outing?] night shirts Thursday October 24 1907 The boys worked at unloading the wheat today. It was done early in the afternoon I was busy with the house work most of the forenoon and in the afternoon I put a new collar on Wills over coat and fixed it up. Billy went to town for his supper and we went down to the church. There were a great many out from town. The supper was good and we had a very pleasant time. We got home at early bed-time.